Ithaca, NY April 2, 2019 – An estimated 600 million birds die from building collisions every year in the United States. 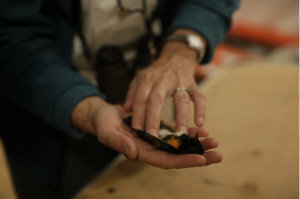 Scientists at the Cornell Lab of Ornithology have published new research highlighting artificial light at night as a contributing factor. They’ve ranked metropolitan areas where, due to a combination of light pollution and geography, birds are at the greatest risk of becoming attracted to and disoriented by lights and crashing into buildings. The research was published today in the journal Frontiers in Ecology and the Environment. It combines satellite data showing light pollution levels with weather radar measuring bird migration density. “Chicago, Houston, and Dallas are uniquely positioned in the heart of North America’s most trafficked aerial corridors. This, in combination with being some of the largest cities in the US, make them a serious threat to the passage of migrants, regardless of season,” notes study lead author Kyle Horton, a Rose Postdoctoral Fellow at the Cornell Lab.